So, Donald, do you have a sweet tooth or savory tooth? Sadly, I’ve always loved meat and have been known to happily consume meals consisting of nothing but meat, meat, and more meat. I am totally aware of the many negative environmental consequences of meat production and the associated cruelty to sentient creatures, so I feel guilty when I think about it. I hope that lab-produced meat becomes practical in the reasonably near future so that I can enjoy my meat without the associated guilt. Could I have that steak with a side of…steak? Yum! What is something you’ve always wanted to try but have been too scared to? Skydiving. I think it would be amazingly exciting. Still, the thought of jumping out of a perfectly good airplane and depending on a parachute packed by a stranger strikes me as taking an unnecessary risk, especially given the consequence of failure. I agree with that! What do you think is the closest thing to real magic? The existence of consciousness (the so-called “hard problem” of philosophy/neuroscience) might as well be magic, given how little we understand how a brain can produce subjective awareness. Even when we eventually identify all of the neural correlates of consciousness, that still won’t explain why subjective experience exists. Having worked my entire life engineering software, I am well aware of AI and robotics. When will AIs become conscious? How can we know for sure given that we can’t even explain why humans and other animals are conscious? Hmm…something to think about! Do you believe in love at first sight? Not sure about first sight, but certainly it need not take long. I began to fall in love in college the first time I heard her sing, though I was too shy and immature to ever act on my feelings. And my current wife (of 30 years) and I decided we were going to marry after only knowing each other for ten days. When it’s right you know it! Movie or book? I hope both. 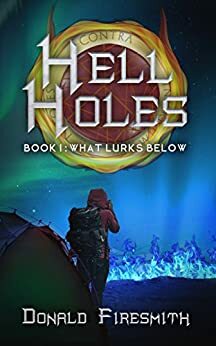 I have two Hollywood producers who want to make a movie out of my first Hell Holes book. I granted them one year’s shopping rights, and they hired a screenwriter to produce a script (which I now own). I updated that script, which you can now obtain from Amazon in the form of an ebook. How neat is that! Congrats on your success! Would you go out in space if given the opportunity? Absolutely. I hope that space tourism eventually becomes reasonably priced before I’m too old to withstand the acceleration of take-off and re-entry. If I was younger and unattached, I would definitely be up for joining a Mars colony or working on the moon. You’re an adventurous person! So on that note, do you believe in aliens? Of course! The universe is so large and contains so many planets (and moons) with liquid water that life has likely evolved on millions (and maybe even billions) of worlds. Still, the number of aliens who have evolved intelligence and created technologies will be far less than the total number of alien species. Whether we will ever have contact given the great distances and timescales is another issue altogether. Well-said! Thank you, Donald, for answering my quirky questions! Support Donald by following his links and reading his works and watching for his movies, and don’t miss a new round of Quirky Questions next Friday!